Post-war Chisinau. June 28th street, but the old-timers still call it Sinadinovskaya. We are five of us. The eldest Mishka is almost seven, I’m just four years old. A sunny summer day. We follow the spy, our neighbor. There is no doubt that he is a spy: firstly, Mishka said this, and secondly, he has a green felt hat, and has a small suitcase, for some reason during the day he is not at work, but walks somewhere. Always alone! According to the law of the genre – we hide behind the trees and run after it. 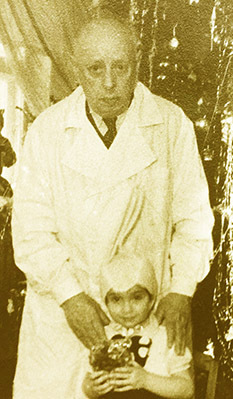 I feel bit ashamed: I know perfectly well that he is not a spy, he is uncle Lazar Voliovich, a wonderful kind doctor and he always has candies in his pocket for sick children. He often comes in the evenings to us, plays chess with my dad, and they talk for a long time about something incomprehensible. Much later, after growing up, from my father I learned the story of Lazar and his family, connected with the tragic and shameful events of the Chisinau pogrom. And later, in more than half a century, someone from above, who is managing time and space, gave me a meeting with Ida Voliovich, his niece, who restored the memory of our hero’s story. It is captured in a documentary about the Chisinau pogrom (“The Pogrom Formula”, directed by Arnold Brodichansky, script A. Brodichansky and E. Leoshkevich, 2003). Part of the family in these terrible April days of 1903 survived. But only physically. Horror and wounded souls, warped fates remained forever. The sisters – Gita and Hana – were abused by scumbags, and they never married. Keeping our traditions, Lazar, too, did not create a family. However, he fulfilled his mission on Earth. And not only professionally, having healed hundreds of patients. He had a special talent to communicate with everyone, regardless of social status. He always helped those who needed it. Caring of his patients, loyal to friends, unpretentious in everyday life. Paradoxically, the stamp “his fate was a mirror reflecting the fate of the country” perfectly suits the life path of Lazar (Leiser) Voliovich. He was born in 1888 in a large family. In 1903, during the pogrom in Chisinau, his family was attacked, the father Shoel-Kelman Voliovich was killed and his two sisters were raped. According to Jewish tradition, the younger brother could not marry until the older sisters married. So Lazar remained alone until the end of his life. A graduate of the Chisinau real school because of the percentage rate could not enter any university of the Russian Empire. Then, in order to get a higher education, Jewish youth had to leave for Europe. He received his doctorate in September 1915in Geneva. 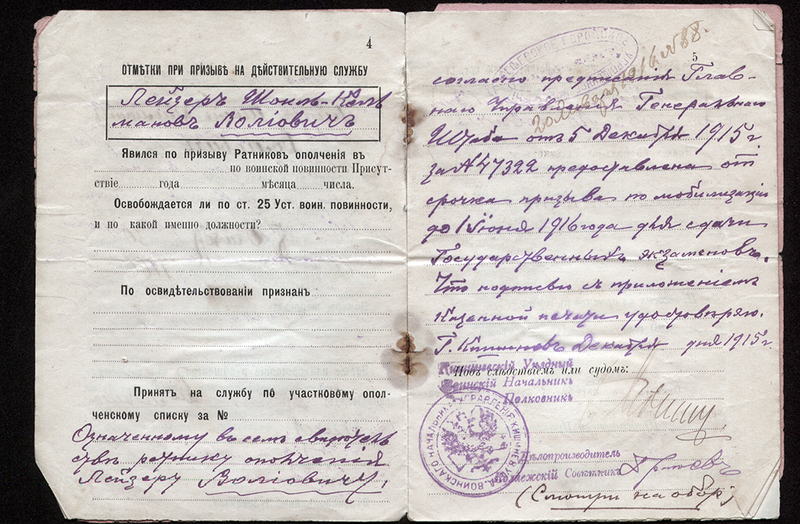 In 1907 the young man was accepted for military registration. 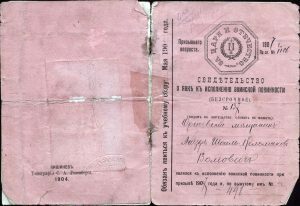 In the “Evidence of performing military service”, “… enlisted in the section of the city of Chisinau in the ranks of a soldier of the 1st rank until the age of 43, that is, until January 1, 1929”. 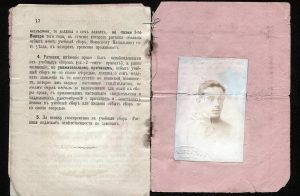 A photograph of a young Voliovich is pasted into the document. Look at this bright, intelligent face. How many painful trials await this boy from 1907. 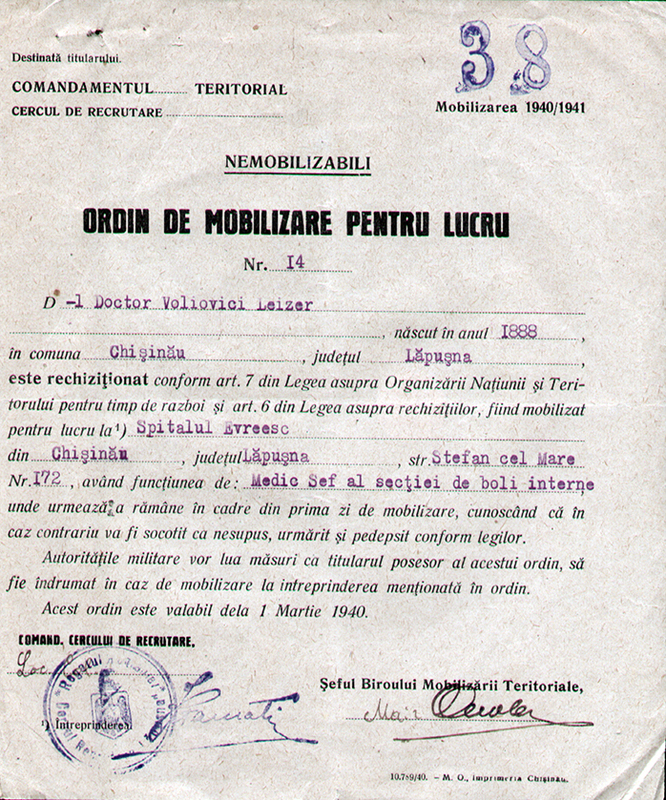 In the same document, after the graduation from the university, the following inscription appears: “According to the instructions of the General Staff Directorate dated December 5, 1915, No. 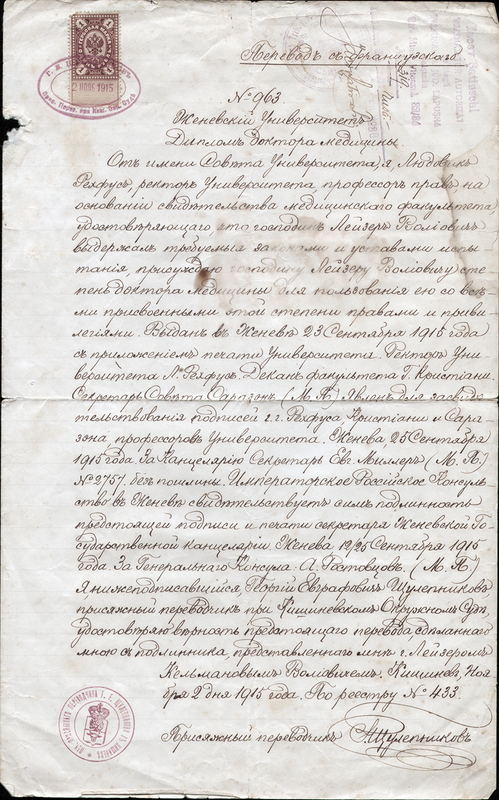 47322, the militiaman Leiser Volyovich is granted a deferment from the call for mobilization until June 1, 1916, for passing of the State examinations.” This is necessary for working in Russia. And look at the dates. It is the World War I. Then come the documents from another life. Already in the Royal Romania, which since 1918 included Bessarabia. 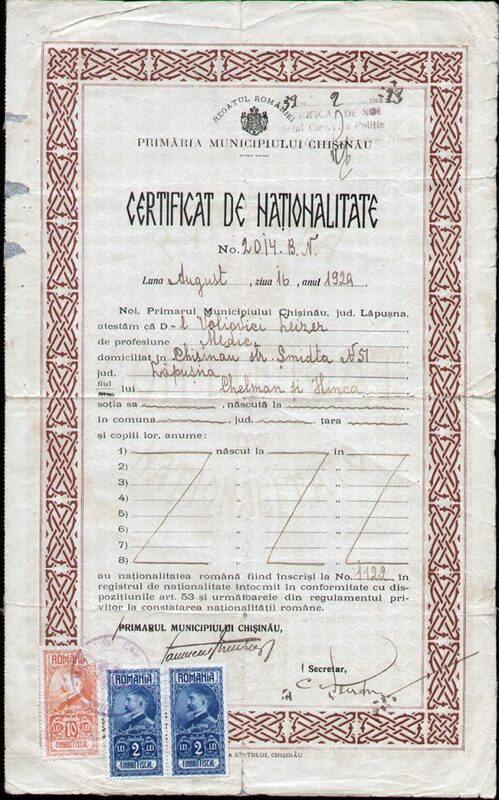 A certificate of Romanian citizenship, issued on August 16, 1929 to the physician Leyzer Voliovich, the son of Kelman and Hinka, who lives in Chisinau at Schmidt Street 51. 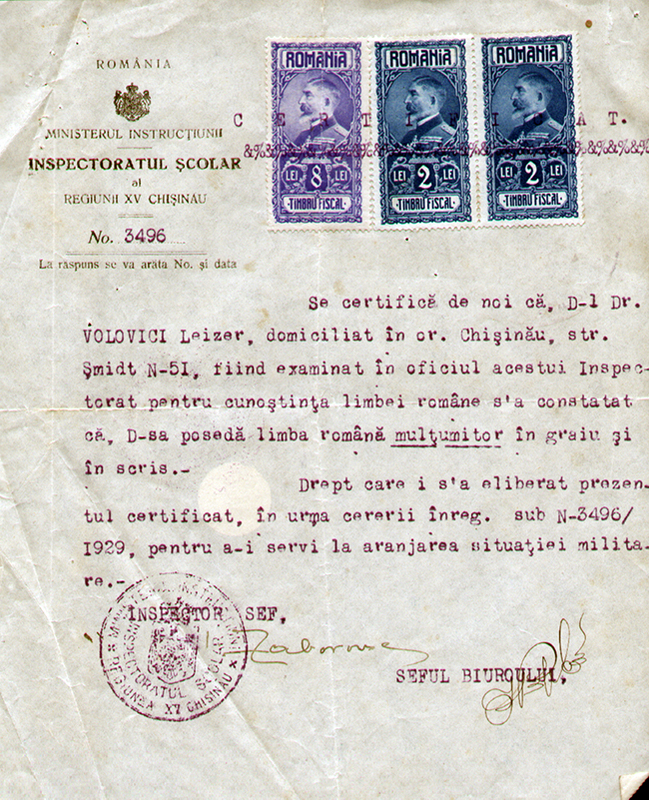 The document of the inspectorate certifying the successful passing of the examination of the knowledge of the Romanian language orally and in writing. We could give other evidences of the life of this remarkable man, but more important is our memory of his good deeds, children’s smiles and grateful parents. Let’s remember Dr. Volovich!